Swiss Miss: A Gathering is an investigation of the sense of separation many people experience when relating with others. What are the social ramifications from feeling emotionally alienated from our fellow beings, how do they affect our society at large and where do these feelings come from? Many of us suffer from an often quite nebulous sense of inadequacy and therefore feel the necessity to hide themselves behind a mask to get a better sense of fitting into the social system. Where does this sense of inadequacy come from? I have been investigating the theme of psychological defense mechanisms for many years, however, I had never before shown any of my work in Switzerland, the country of my origin. Bringing this work to Zurich, the area where I grew up, was therefore an especially challenging and exciting experience for me. In such a small and homogenous society the pressures to conform are often even more extreme than in more diverse societies. In that sense, as well for me this event became an experience of unveiling: going back home and revealing my own true face - taking a straight look into the eyes of my own demons. 1: In the weeks leading up to the exhibition the cheerful Swiss Miss walks around the city of Zurich approaching strangers to ask them to write down anonymously a confession of something hidden in their minds which creates a sense of shame or inadequacy. 2: At the opening event of the exhibition the painful transformation from a delightful and proper singing and dancing sweet Maiden to her inner, very erratic and threateningly awkward worm-like being takes place. In form of this inner worm she unveils her own confessions: these sculptures are solidified mirror images of her tubular self erupting with various spontaneous expressions. After the unveiling some of the collected confessions from the people she met leading up to the show are being read aloud. Finally at peace with all her facets Swiss Miss can now transform back to her socially more known appearance. 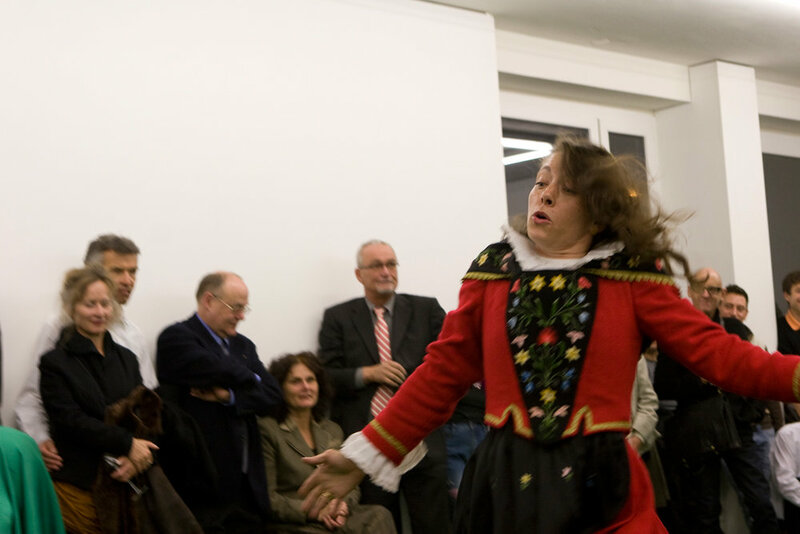 Installation covered: The delightful Swiss Maiden is singing and dancing in the green meadows. Behind her is a bell tower, a common meeting place. Installation uncovered: Swiss Miss has transformed into her much more erratic and unpredictable inner worm like being. As this creature has not been taught the rules of civilization it knows no verbal language and can't walk upright, but rolls awkwardly on the floor from hill to hill to unveil her confessions. Each of the confession is like a mirror image of her own self frozen in time. a hard ceramic shell with this or that uncouth expression. The bell tower can be seen as the social back bone of a community but in this case also as the spinal column which holds an individual together with all it's many personalities. The performance is taking place in a gallery space resembling a luscious pasture with a giant bell tower soaring in its center. In this lovely setting the painful transformation from a delightful and proper singing and dancing Swiss Maiden to her inner, very erratic and threateningly awkward worm-like being takes place. It is in this transformed state that Swiss Miss gives life to all the sculptural pieces through an exhausting process of unveiling. After every character has been revealed; sculptures, reminiscent to reflections of her suppressed spontaneous aspects when everything is out in the open, the worm creature crawls into the tower, calls out a few of the previously collected confessions and rings the bell to announce and celebrate the moment of liberation. At peace now with all her aspects, the worm returns to its shed former skin, devours it and exits the scene to finally reappear dressed again as Swiss Miss, peacefully socialized, to greet the audience. Swiss Miss starting her tour of collecting confessions. This is Swiss Miss with her tower of shame on her back. She will liberate the people of Zurich from their heavy burdens of guilt. Would you like to be relieved of your sins? For two weeks she wanders around Zurich asking people to make confessions of memories or thoughts about themselves which create a sense of shame or inadequacy. This is historically a very significant experience, as with the abolishment of confession since the reformation many centuries ago, there has never been an organized opportunity to relieve oneself from such burdens. Dropping them into the tower will be a relief! The confessions are to be written down anonymously on a piece of paper, then folded and dropped into the tower of shame she's carrying on her back. Lawyers also need to make some confessions. Any chance there might be an overlooked inadequacy? The woman in the foreground slipped away! Come back!! All these confessions she collected. The people in Zurich were very eager to participate! The Grossmünster Zürich is the church where Ulrich Zwingli the reformator of Zurich preached. Even though he fell in battle, the catholics in this area were defeated and confession was abolished, along with all the saints, the music during mass, the comfortable pews for sitting and all the beautiful murals on the walls in the churches. Religion was stripped of all it's filigree. Here she is with a couple of more confessions. She's singing an old song praising god the creator and nature. The world is at peace! She seems to not be able to control what's happening to her. This one wears a fuzz-helmet! There is lots of glamour happening here!! This one seems dead! Looks like there was an accident that happened here! These are all the confessions which Swiss Miss collected during her walks around town. The gallerist seems very happy! She should never have had that baby!!! This piece is inspired by my grandmother's knitting bag.